Strategic Execution is all about the process of getting work done and executing your plan. develop a Do Rhythm that helps people stay focused on priorities. build a habit of reviewing data and insights weekly to make necessary adjustments. We call Execution the Do Rhythm, part of our Think Plan Do methodology. It is your process of getting work done and executing your plan. 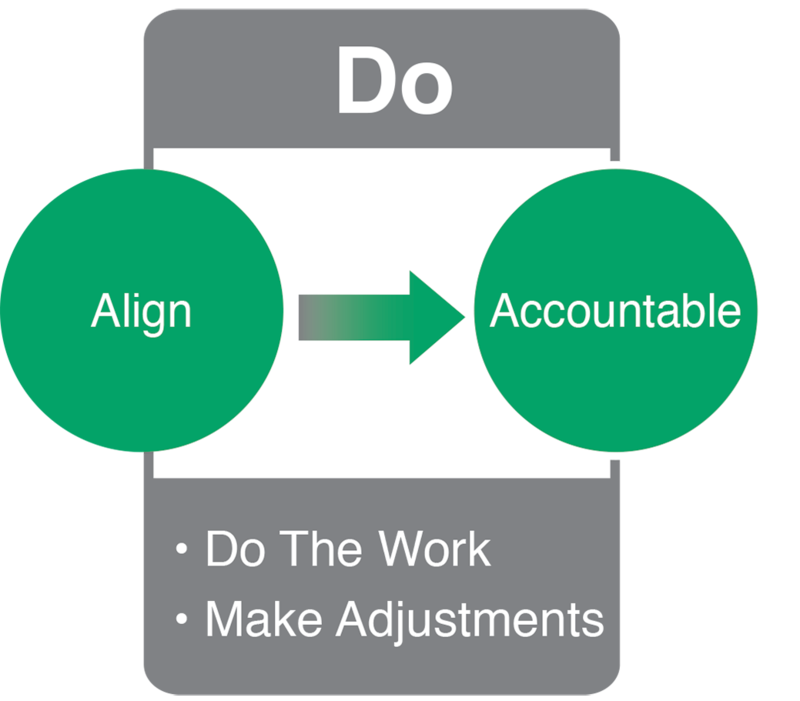 By being accountable to your execution plan, you can discover which critical adjustments need to be made and brainstorm options and opportunities. When we make adjustments proactively, we achieve our goals faster. Below are all the most important proven aspects of execution, Doing the work. Our software and consulting team will help you work on all of them. Visit each page to learn more. Collaborate To Get The Work Done - collaborating on priorities can accelerate your decision making and progress to achieve your goals and plans. Daily Huddles - The Daily Huddle is a simple and effective way to keep your entire company focused and aligned. Weekly Meeting Prep - Weekly Meeting Prep is part of your Do Rhythm. We call this time a "Weekly Meeting with Yourself." Weekly Meetings - These meetings help you maintain team Focus, Alignment, and Accountability to achieve your quarterly plan. Monthly Meetings - A well structured one-day monthly management meeting drives alignment and engagement. Other Meetings - You can use the Rhythm software to record Meeting Notes and Action Items from any meeting in your business. KPIs - KPIs are Key Performance Indicators for your business. They are the handful of metrics that are most important to your business' health and success. Action Items - Action Items, or Who, What, Whens, are where the details of your execution plan come together. High Performance Teams - (People Energy Map) The best vision in the world without the right people to execute it will not get you very far. Call one of our Rhythm experts to get all your questions answered. Schedule a demo with an expert to learn how Rhythm streamlines strategic planning and execution.